Teoscar Jose Hernández ... Born on October 15, 1992 in Cotui, Dominican Republic ... Signed by the Houston Astros as an 18-year-old international free agent on February 17, 2011. Had 58 of his 114 hits go for extra bases (29-2B, 7-3B, 22-HR)... His 50.9% XBH rate was 7th highest in MLB ... Slugged .711 on inside pitches, 2nd best in MLB (MLB avg: .451) ... His seven triples were the most by a Blue Jay since Alex Rios had eight in 2008 ... Finished 2nd on the team with 223 total bases (Justin Smoak-231) ... Recorded 11 outfield assists, 3rd most in the AL (Andrew Benintendi-12, Mitch Haniger-12) ... Was assigned to Triple-A Buffalo to start the season ... Recalled to the Blue Jays from the Bisons on April 13 and made his season debut that night in Cleveland... Went 2-for-5 with two doubles and two RBI ... Went 4-for-6 on April 18 vs. KC for his 1st career four-hit game...Finished a double shy of a cycle...Hit his 1st career triple... Hit his 1st home run of the season, after connecting for eight in 2017 ... On April 22 at NYY, belted the 3rd home run in his last five games...Was his 30th RBI since joining the Jays on Sept. 1, 2017, the most on the team over that time ... Connected for his 4th home run of the year on April 29 vs. TEX…Hit 12 home runs in his first 40 games as a Blue Jay - tied for 2nd most in team history (Tony Batista-13, Troy Glaus-12) ... Put together a career-long nine-game hitting streak from April 25-May 3 (G1) ... On May 9 vs. SEA, hit his 6th home run and also singled and doubled, leading off the 1st, 4th and 6th innings with a hit... Marked his 4th career 3+ hit effort and his 2nd of the season (4H on April 18 vs. KC) ... Hit a triple after Devon Travis tripled on May 28 at BOS, forming Toronto's first back-to-back triples since July 27, 2012 at DET (Brett Lawrie/Omar Vizquel) ... Notched his 9th home run of the season on June 5 vs. NYY to mark a new career high (eight in 2017) ... Had a four-game RBI streak (6RBI) from June 8-11, his longest of the season and the 2nd longest of his career (6G: Sept. 22-27, 2017) ... On June 9 vs. BAL, hit his 5th triple of the season in his 190th at-bat, matching the team's entire total from 2017 (5,499 AB) ... Tied a career high with four hits on Aug. 3 at SEA (also April 18 vs. KC), including three doubles for his 1st career 3-XBH game ... Homered in consecutive games for the 4th time in his career on Aug. 8 and 9 vs. BOS... Gave him eight home runs and 20 RBI in 20 career games vs. BOS ... Hit his 19th homer on Sept. 2 at MIA... Ended a 17-game homerless drought, his longest since joining the Jays ... Reached the 20-HR mark for the 1st time in his career on Sept. 9 vs. CLE ... Homered in back-to-back games for the 3rd time of the season on Sept. 28 and 29 at TB. Started the year with Triple-A Fresno...Was called up to Houston on April 25 and made his season debut as a defensive replacement in right field (no at-bats)...Was placed on the DL the next day with a bruised left knee ... Came off the DL on May 14 and was sent to Fresno where he hit .279 with 20-2B, 3-3B and 12-HR over 79 games ... Acquired from the Astros with OF Norichika Aoki in exchange for LHP Francisco Liriano on July 31 and assigned to Triple-A Buffalo where he hit .221 in 25 games (6-HR, 22-RBI, 4-SB, .811 OPS) ... Recalled from the Bisons on Sept. 1 and made his Toronto debut that night in Baltimore (1-for-4, 2B, BB) ... Went 3-for-4 with two home runs and five RBI on Sept. 10 vs. DET, his 1st career multi-homer game...Became the 4th Toronto rookie all-time with at least 2-HR and 5-RBI in a game...The others were Carlos Delgado (April 11, 1994 at OAK), Felipe Lopez (Sept. 4, 2001 vs. NYY), and J.P. Arencibia (April 1, 2011 vs. MIN)...Became the 13th rookie in Blue Jays history to collect 5-RBI in a game (last: Anthony Gose on Sept. 8, 2012 at BOS) ... Put together a six-game RBI streak from Sept. 22-27, the longest by a Blue Jay in 2017...Hit .346 (9-for-26) with a double, six home runs and 11 RBI over that span ... Homered for the 3rd consecutive game on Sept. 24 vs. NYY, becoming the 1st Toronto rookie all-time to do so ... Recorded his 2nd career multi-HR game on Sept. 26 at BOS...Became the 1st Toronto rookie all-time to record two multi-HR games in a single month and the 8th different Toronto rookie to record two multi-HR games in a season (last: Arencibia - 2011) ... Hit a two-run home run with two outs in the 9th on Sept. 27 at BOS...Marked his third consecutive first-pitch HR...Extended his Blue Jays rookie-record HR total for September to eight, which tied for the 2nd-most by a Toronto rookie in any month in club history (Cruz Jr.-9 in August, 1997; Delgado-8 in April, 1994)...Drove in his 19th and 20th runs of September, setting a new record for the most RBI in September by a Blue Jays rookie (Josh Phelps-19 in 2002)...Was his 6th straight game with an extra-base hit to join Steve Staggs (7), Shannon Stewart (6) and Bob Bailor (6) as the only Toronto rookies to have an XBH in six or more consecutive games ... Went 23-for-88 (.261) with 16-R, 6-2B, 8-HR, 20-RBI and 6-BB in 26 games as a Blue Jay (.305 OBP, .908 OPS). Posted a .420 slugging percentage in what was his first Major League season...11 of his 23 hits went for extra bases (7 doubles and 4 homers)...his slugging percentage ranked 10th among AL rookies with at least 40 games played...made 38 appearances and 28 starts in the outfield for the Astros this season...made 13 starts in left field, 10 in center field and five in right field...became the fifth player in club history to post three HR within his first 10 games in the Majors, joining J.D. Martinez (4), Tyler White, Carlos Correa and Jon Singleton...also joined Joe Morgan as the only players in franchise history to record a three walk contest within a player's first nine career games in the Majors...opened his season with Double A Corpus Christi and was named a Midseason and Postseason Texas League All-Star for his work with the Hooks...was with the Hooks for 69 games before being promoted to Triple A Fresno on June 30...was with the Grizzlies for only 38 games...had his contract selected by the Astros on Aug. 12, where he remained through the end of the season...went 2x4 with a walk and a solo homer off of Francisco Liriano for his first Major League hit...became the fifth player in franchise history to homer in his first Major League game joining Jon Singleton (6/3/14 vs. LAA), Mark Saccomanno (9/8/08 vs. PIT), Dave Matranga (6/27/03 vs. TEX) and Ken Caminiti (7/16/87 vs. PHI)...broke up Carlos Martinez's no-hit bid with a double down the LF line to lead off the 6th inning on Aug. 17 vs. STL...was his first career double...recorded a career-high three hits on Aug. 19 at BAL...also recorded three RBI and three runs scored... became only one of nine rookies in franchise to record these numbers in a single game...the last to do so was Carlos Correa, who accomplished this three times in 2015...finished the season riding a career long four-game hitting streak from Sept. 28- Oct. 2...split his 2016 minor league season at the Double A and Triple A levels, combining to hit .307 (130x423) with 28 doubles, 10 home runs, 53 RBI and a .377 OBP in 107 games en route to being named a MiLB.com Organization All-Star...played his last 38 minor league games at Triple A Fresno, hitting .313 (45x144). Entered the season ranked as the Astros No. 9 prospect by Baseball America...had a down year in a full season at Double A Corpus Christi, hitting .219 (103x470) with 17 homers and 48 RBI...played primarily center field (77gs), but did make 37 starts in right field...following the season, was eligible for the 2015 Rule 5 Draft, but was left unprotected by the Astros...played Winter Ball in the Dominican, hitting .275 (11x40) with a homer and four RBI in 17 games. Posted his highest single-season OPS of his career (.897), while splitting time at Class A Lancaster (96g) and at Corpus Christi (23g)...combined to hit .292 (142x486) with 37 doubles, nine triples, 21 home runs, 85 RBI and 33 stolen bases at the two levels...named a California League Midseason and Postseason All-Star for his work at Lancaster...also named an Organization All-Star by MiLB.com...began his season at Lancaster and played for the JetHawks for four months before his promotion to Corpus Christi on Aug. 4...following the season, played for the Toros del Este in the Dominican Winter League and hit .228 (18x79) with 12 RBI in 34 games. Played his entire season at Class A Quad Cities...led the Midwest League in runs scored (97) and ranked second in outfield assists (14)...named the Quad Cities Player of the Month for April after hitting .297 (27x91) with seven doubles, three triples, 12 RBI and eight stolen bases in the month...played his first season for the Toros del Este in the Dominican Winter League and appeared in 23 games. Combined to hit .243 (49x202) with 13 doubles, two triples, five home runs and 11 stolen bases in 59 games with the GCL Astros (51g) and for Class A Lexington...debuted stateside for the GCL Astros in June and appeared in 51 games before a late-season promotion to Lexington on Aug. 25...while with the Astros, named the club's Defensive Player of the Month for August. In his first professional season, was named the DSL Astros Team MVP after posting an .847 OPS with a .274 (62x226) batting average, 13 doubles, seven triples, seven home runs, 35 RBI and 16 steals...finished fourth in the DSL in triples and fifth in home runs...was also named the DSL Astros Offensive Player of the Month for July after hitting .298 (25x84) with six doubles, three triples, five home runs and 19 RBI in 22 games. January 17, 2019 Toros del Este placed OF Teoscar Hernandez on the reserve list. November 26, 2018 OF Teoscar Hernandez assigned to Toros del Este. November 26, 2018 Toros del Este placed OF Teoscar Hernandez on the reserve list. April 13, 2018 Toronto Blue Jays recalled LF Teoscar Hernandez from Buffalo Bisons. 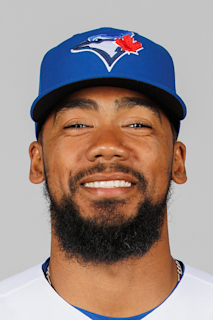 March 29, 2018 Toronto Blue Jays optioned RF Teoscar Hernandez to Buffalo Bisons. September 1, 2017 Toronto Blue Jays recalled Teoscar Hernandez from Buffalo Bisons. August 1, 2017 RF Teoscar Hernandez assigned to Buffalo Bisons. May 14, 2017 Houston Astros optioned RF Teoscar Hernandez to Fresno Grizzlies. May 11, 2017 Houston Astros sent OF Teoscar Hernandez on a rehab assignment to Fresno Grizzlies. April 26, 2017 Teoscar Hernandez roster status changed by Houston Astros. April 25, 2017 Houston Astros recalled LF Teoscar Hernandez from Fresno Grizzlies. March 21, 2017 Houston Astros optioned LF Teoscar Hernandez to Fresno Grizzlies. August 12, 2016 Houston Astros selected the contract of Teoscar Hernandez from Fresno Grizzlies. June 30, 2016 CF Teoscar Hernandez assigned to Fresno Grizzlies from Corpus Christi Hooks. March 5, 2016 OF Teoscar Hernandez assigned to Houston Astros. November 23, 2015 OF Teoscar Hernandez assigned to Toros del Este. March 16, 2015 OF Teoscar Hernandez assigned to Houston Astros. August 4, 2014 CF Teoscar Hernandez assigned to Corpus Christi Hooks from Lancaster JetHawks. July 19, 2014 Lancaster JetHawks activated CF Teoscar Hernandez from the 7-day disabled list. July 11, 2014 Lancaster JetHawks placed CF Teoscar Hernandez on the 7-day disabled list. April 2, 2014 OF Teoscar Hernandez assigned to Lancaster JetHawks from Quad Cities River Bandits. March 8, 2014 OF Teoscar Hernandez assigned to Houston Astros. October 19, 2013 OF Teoscar Hernandez assigned to Toros del Este. July 18, 2013 Quad Cities River Bandits activated OF Teoscar Hernandez from the 7-day disabled list. July 9, 2013 Quad Cities River Bandits placed OF Teoscar Hernandez on the 7-day disabled list retroactive to July 8, 2013. August 25, 2012 OF Teoscar Hernandez assigned to Lexington Legends from GCL Astros. June 14, 2012 Teoscar Hernandez assigned to GCL Astros. May 28, 2011 OF Teoscar Hernandez assigned to DSL Astros.